This is number 2A of a 2 part series on basement repairs. In Part 1, we discussed waterproofing block wall foundations. In Part 2A shows how to identify leaks that need waterproofing in basement walls, and floors that are made out of poured concrete. Part 2B will deal with the actual repairs to poured concrete leaks. In our last piece we discussed how many homes and businesses experience leaky basements year after year. The worse time is in the spring after winter accumulation of snow. There are a number of prudent things that you can do to improve drainage against your foundation like roof gutters, grading and improvement of drainage. The recommendations here do not replace that conventional wisdom. It is designed to augment and improve upon these conventional methods. The nice thing about poured concrete is that it holds water back very well. The leak typically happens at a cold joint or in a crack or hole in the concrete. Fresh (plastic) concrete doesn’t bond to hardened concrete. The exception is when a special epoxy bonding agent like Epoxy.com Product #2007 – is used (this bonding agent will be discussed in a future article). When concrete has hardened or has started to harden and you pour more concrete against it (without the right bonding agent) you get what is called a cold joint. These cold joints are a common source of water leaks. Virtually all basements are built with a giant cold joint – the cold joint between the floor and the wall. Typically there is some sort of water-stops material installed in these joints intended to stop leaking at this cold joint. These water-stops can fail. So the wall to floor joint in a concrete basement is a frequent source of water leaks. Then there are the ties that go through the concrete to hold the forms together on either side during the pour. If these form ties are not installed perfectly or if the concrete is not totally vibrated around them, these ties can act as a conduit to let the water in. When concrete cures it shrinks that is called “plastic shrinkage”. 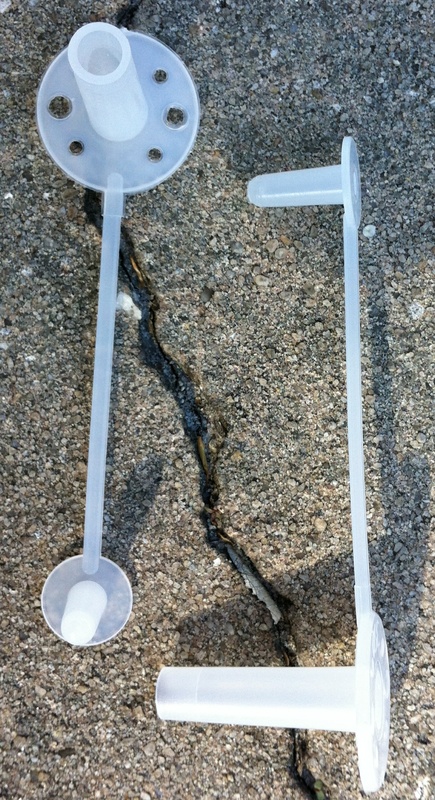 That plastic shrinkage can and usually does result in the concrete cracking. These cracks are one of the easiest ways for water to get into your basement. If the water makes it to the fill side of the tank (under the floor or against the wall) it will typically leak out into your basement. You should look carefully for these cracks when looking for potential leaks into your basement. If you are able to investigate into the water infiltration into your basement when it is leaking it will be easy to see. If trying to find the source of leaks when the basement is dry you have to look for water marks on either side of the cracks and beneath the areas that might be leaking. In the next installment on this topic, I will deal with how you waterproof the cracks while structurally repairing them with epoxy and similar materials. You are currently browsing the archives for the adhesive category.